Monitoring of achieved energy savings will be done by utilizing data collected by ProjectZero combined with information extracted from energy performance certificates for the houses when a house have a certificate before and after implementing the energy saving measures. 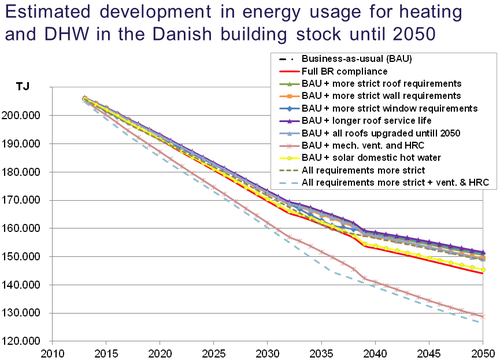 Additionally, the Danish Building and dwelling stock register (BBR) starts collecting information about delivered energy to individual homes. If this information becomes available and reliable during the project, it will be utilized for validation of the achieved energy savings. The overall target for ProjectZero is to have 25% less CO2 emissions from Sønderborg municipality in 2015 compared with the situation in 2010. This goal will be reached by significantly more efficient energy consumption and increasing energy supply from the area’s own renewable energy sources. The underground of Als (the island where Sønderborg is situated) contains bubbling hot water that will be used for CO2-neutral district heating. Thus a massive investment in expanding the district heating network was completed by the end of 2012. Manure and straw from farming will be converted into green energy and green fertilizer in large biogas plants. For the purpose of EPISCOPE the focus is on area’s 18,600 home owners, who will now gain inspiration and knowledge about energy renovations that both ensure future housing values and reduce energy consumption. 1,200 homeowners will be offered free energy advice. More than 800 completed reviews have already sparked a growing demand for contractors who can implement energy renovations.